This is a recent install from Final Cut Synthetic Turf out of Twin Falls, Idaho. 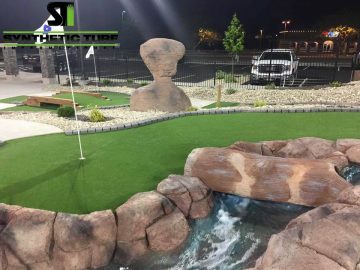 This project was an 18 hole mini putt-putt for their home town of Twin Falls, Idaho. The course was designed by Harris Miniature Golf out of New Jersey. The whole project ended beautifully, they were able to open for Memorial Day and it has been a huge success in their community ever since. Two good friends of Hailey and Jason of Final Cut Synthetic Turf are the owners of this project and they requested that Final Cut Synthetic Turf install instead of Harris’ normal company they use out of Florida. Hailey and Jason in turn then requested that they use only Synthetic Turf International products. 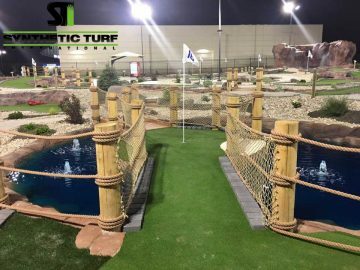 With the help of STI they were able to meet their pricing requirements and Final Cut Synthetic Turf got to be the installer. It is worth noting that this was a very tough project. The course builder said it was one of the hardest courses he has ever built. It has large contours and many surprise traps. In total, there was approximately 10,000 sf of turf installed over the course of 6 six days. The community has been absolutely ecstatic about this much needed family friendly activity .